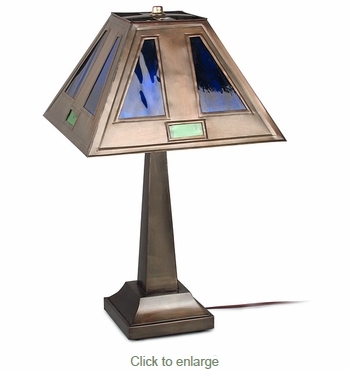 The perfect rustic lamp for your desk, hall table or nightstand. The handcrafted tin shade features blue and green colored glass inlays. Our rustic metal lamps will illuminate any southwest or rustic decor in your home or cabin. The aged tin lamp bases and shades are individually hand crafted by the talented tinsmiths of Mexico. Since each metal shade and lamp base is hand crafted, variations in color and finish may vary slightly from what's pictured here. • Wired with UL listed parts, but not a UL Listed lamp.